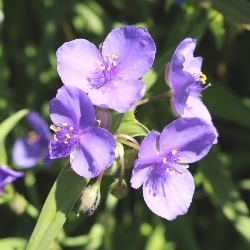 Tradescantia, better known as Spiderwort, blooms for about 2 months from late spring to mid summer. You can use Tradescantia to plant over and around spring-flowering bulbs to hide the bulb's foliage as it matures naturally, while adding late spring and summer color. Tradescantia Virginiana is a species of Spiderwort that is native to the eastern US. It has violet-blue to purple, three-petaled 1 1/2" flowers with yellow stamens, lasting only a day. They continuously bloom from May to July. Tolerant of poor soils, they grow quickly and easily - can be invasive. This item ships in Fall. To order Spring Planted Tradescantia, please see: http://www.marysgardenpatch.com/tradescantia-Spring.